Dakgootinstallatie, waterdicht maken en schilderen van de buitenkant van een gebouw is een project dat wordt voltooid voor de volgende data voor fase 1. Voor het schilderen van de buitenkant van het resort zijn steigers op de onderstaande gebouwen nodig. De eerste fase, die eind juni begint, omvat de volgende gebouwen: Gebouw 1, Hibiscus (30 juni - 31 augustus 2019) Gebouw 2, Bougainvillea (1 september - 31 oktober 2019) Gebouw 3, Guava (1 november) - 31 december 2019) Daarnaast zullen, als onderdeel van onze verfraaiings- en veiligheidsinitiatieven, trottoirs en paden door het hele resort ook worden gerepareerd. De geplande start van het werk is gepland voor september en zal naar verwachting eindigen op 31 oktober 2019. Roosters zijn altijd onderhevig aan vertragingen. • Prachtige zoutwaterpool geëerd door Fodor's als een van de beste tien beste zwembaden in de VS.
Condo 1557 is nicely situated close to all the amenities offered by he Hanalei Bay Resort. The bed was large and comfortable and the bathroom was modern and clean. The view from the balcony was lovely. The only improvement I could suggest for the room is the inclusion of a microwave oven and a hot water kettle. While there is a refrigerator in the unit, it did not have ice-making capabilities. Otherwise, the unit lived up to expectations. Aloha Jeffrey, Thank you for your review of unit 1557 at the Hanalei Bay Resort. Thank you for your comments on the unit , its amenities and clean condition. We wish we could accommodate the guests with a microwave and water kettle but the county of Kauai has put restrictions on these units and will not allow those items. Our website does reflect this information and does not list those items as part of the rental so that when booking guests are completely aware. We are hoping that some point in time the County will left the restriction. My husband and I recently did a vacation at Hanalei Bay and it exceeded expectations. 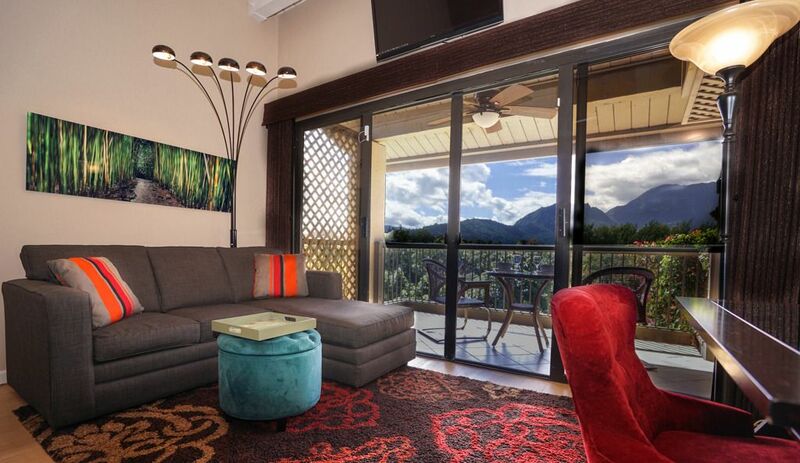 The condo is a studio with a beautiful view of the mountains. We used the local grocery store, which was a couple miles away to stock up on snacks and sodas, which I'd also recommend. The entire property is beautiful and the staff was so friendly and accommodating. We will 100% be back! We loved it for the first half of our honeymoon. Amazing view of the mountains from the balcony and great access to Queens Bath and Hanalei Bay. Loved everything about it. Hanalei Bay and the Princeville area is amazing! We are very grateful that we came across Hanalei Bay Resorts as an option to stay. The grounds are very well kept and beautiful, the condo which was a studio unit was clean and perfect for what we needed, and the location was very convienent to run into town, hang on the beach or explore the island. The condo was very comfortable and well decorated. The memory foam bed provided a great night sleep. The lanai and the view were gorgeous. Kitchen was fully stocked. Wifi directions were confusing. We could only connect to the hotels wifi, not room wifi. This was fine, although speeds were slow. The A/c was on its way out, so it was a little warm, but since we're from a warm climate the temp didn't bother us much. We stayed 7 nights. Since it's a condo rental, we didn't have a cleaning. By day 7, the condo was as dirty (sandy) as I could really take it, so I'd recommend trying to schedule a cleaning if you stay longer. Aloha, Thank you for your review for the unit 1557 at the Hanalei Bay Resort. We are happy to hear you found the condo comfortable and well stocked. The views of the mountains are amazing! The WiFi is a resort amenity and not specific to the unit or the owner of this unit. There is not a separate WiFi for the unit itself. The resort WiFi works in all the units of the resort. Therefore when there is a problem with the WiFi, it should be directed to the resort. We are happy to say, a brand new air conditioner was installed yesterday so there will be no further problems with cooling. If you do let us know ahead of time we can schedule a midstay clean during your stay for a fee. However the unit is supplied with a vacuum, broom and other cleaning products to use. Thank you again for your feedback and we hope you might be able to come again and stay. My husband and I loved this location for our babymoon! The condo is updated, bed is extremely comfortable and the view is AMAZING from the balcony. The resort has all of the needed amenities - pool, beach access, towels, bar. I highly recommend this location and would definitely stay again! Thank you for the great hospitality! Aloha, Thank you for the glowing review of unit 1557 at the Hanalei Bay Resort. The location of the resort and the views from the condo are amazing. The resort amenities are many! Thank you for your recommendations and we hope you do come and stay again!